A single head of elephant garlic. Back in the 1980s, on a cold day in January I was preparing for the arrival of a newspaper reporter. She was coming to interview me about what was in the garden that month. When she had called a week earlier, she said she was looking for a garden story idea but assumed there was nothing still in the ground and maybe we could do a story on soil preparation. I explained that with our mild Ozarks winters, that yes, I did still have food growing in my garden. Carrots and leeks were still in the ground, lettuce, peas and spinach were growing in a cold frame. As is my custom when reporters come, I invited her for lunch, to taste a bit of the garden. That day we dug carrots and picked lettuce and spinach for her photos. Those went into a salad, which I served with Elephant Pie. Elephant Garlic Pie, that is. I like elephant garlic as a vegetable, it has a mild, sweet flavor that works well in all sorts of dishes. Even steamed and buttered, it's delicious. 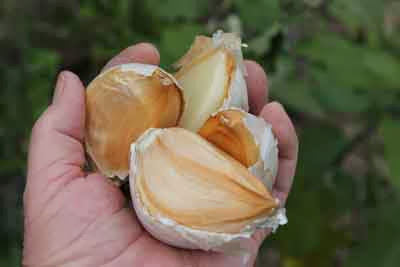 Elephant garlic, you may not know, was first introduced to the gardening world by Nichols Garden Nursery in 1941. 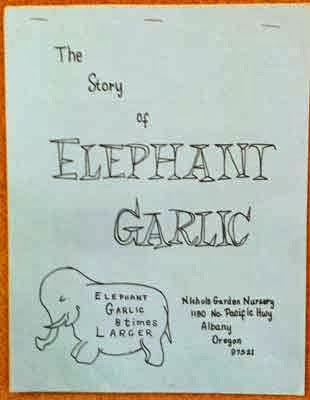 (Someone later gave Luther Burbank credit, but the documentation is clear, the first elephant garlic, along with the name, started with Nichols Garden Nursery in Albany, Oregon. Areas of the famous Willamette Valley, known for its mild climate and amazingly fertile soil, was settled partly by immigrants from Czechoslovakia and Northern Yugoslavia. Mr. Nichols discovered that some of these folks were growing an enormous variety of garlic, mild in flavor and vastly different from any garlic he had ever seen. They had brought this unusual garlic with them from the Old Country. He purchased 12 pounds as seed stock in 1941 and began cultivating it. When he finally had enough to sell, he began advertising in newspapers and magazines. In 1953 he gave it the name, elephant garlic. Back then, he was the only one selling it and when you ordered elephant garlic from Nichols, in your order you received a little pamphlet with growing and storing instructions. He sold elephant garlic across the U.S., Canada and to many countries overseas. I just planted my elephant garlic this past week from some I ordered from Nichols. I prefer to plant it in September, but things were too busy this year. I've actually planted it as late as the first of December and it has done well, thanks to our fairly mild winters here. Next summer, probably about mid-June, my elephant garlic will be ready to dig. You can still order some for planting from Nichols. I've seen it in the produce department of several grocery stores if you want to get some to cook, but to get a start to grow, of the original, authentic elephant garlic, order from Nichols. (Every other nursery or seed company that sells elephant garlic, can trace their original sources back to Nichols). Here's my Elephant Garlic Pie recipe. It's like a quiche and you can add a regular pie crust if you wish, but I usually make mine crust-less because it cuts down a bit on the carbohydrates and fat. Saute the sliced elephant garlic in olive oil or butter until tender, about 5 minutes. Beat the eggs and milk together; add the cooking sherry, hot sauce, green onions and salt and pepper. 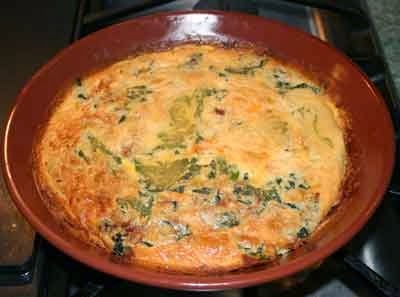 In a oiled pie plate, layer the garlic, cheese, spinach and ham, then pour the egg mixture over. Dust with a bit of paprika if desired. Bake until a knife inserted comes out clean, about 35-40 minutes. Let set for 5 minutes before serving. Nichols Garden Nursery also is the source of my favorite sour dough starter. Mr. Nichols got the start in the late 1940s from a friend who'd been a logger in Alaska. They sell it in powdered form and you mix it with your own bread flour and get it started. 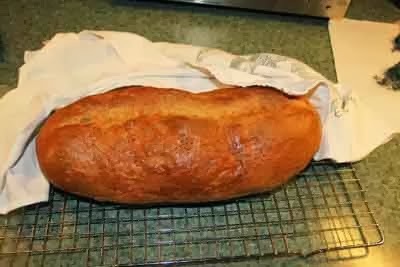 We make 2 loaves of sourdough bread a week here at the farm. Sourdough bread is considerably easier for diabetics to eat and Nichols' starter is the best tasting I've ever had. (I don't care for the San Francisco sourdough breads, they're too, well, sour, for me, but Nichols' Oregon Pioneer starter tastes lots better). Here are a couple of recent loaves of sourdough bread we've made. Freshly-baked sourdough bread is simply delicious! Sounds scrumptious, Jim! There will definitely be the sound of a herd of elephants in this house charging to the table when I make this. I never knew that Nichols was responsible for this wonderful plant - or that they carried sourdough starter (some PR ideas for Rose Marie). I enjoyed this post very much. I have always wanted to try elephant garlic and I am going to do it this year - just placed my order! 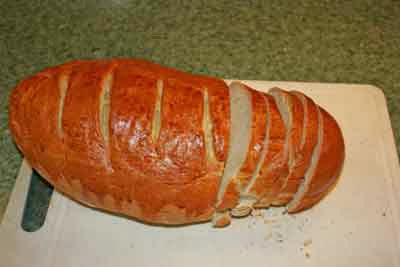 I am also going to try the sourdough starter - do you have a recommended recipe for the bread you make? 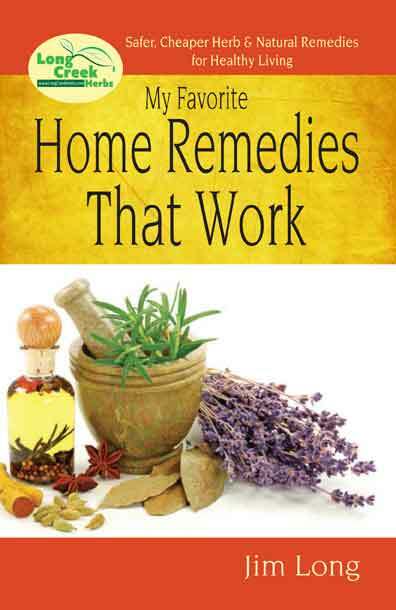 Thank you for so many years of great herbal information! I have this starter but lost the instructions! Just have the info on the label saying mix with 2c flour, 1.5c water, then let sit for 24 hours. Any advice how to go from there? I'm new to this and very lost! I have this starter but I think I lost the instructions (aside from those on the label). I've already added the 2c of flour and 1.5c of water and let it sit for 24 hours as stated. Where do I go from there? Any advice would be helpful, as I am lost! Ali, you should probably email Rose Marie McGee at Nichols Garden Nursery (go to the "Contact Us" section on their website). The starter came from them and she can email some suggestions for what's next. My partner is the one who makes great bread, I'm not knowledgeable enough to give advice. Good luck!